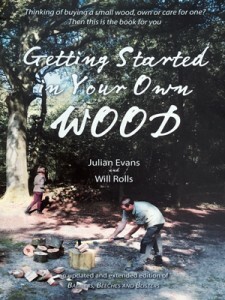 Some years ago Julian Evans, a retired professor of forestry and an owner of a small woodland, wrote a book to help new owners of woodlands. It was called "Badgers, Beeches and Blisters" and has been extremely helpful to hundreds of owners, perhaps thousands. This book has now been updated and re-written with new sections on emerging issues. Some of the new material has been written by Will Rolls, author of "The Log Book" particularly chapters on woodfuel and tree diseases. The new book is called appropriately - "Getting started in your own wood" and is just out and available online for £12.95. It's easy to read and is a guide to looking after and caring for a small woodland. Julian's writing was inspired both by his experience in his own small woodland and by his meeting with what he calls "a new breed of owner" who is hands-on, actively engaged in managing the woodland and who actually uses his/her own home-grown timber and firewood. These new owners bring new energy and enthusiasm to their woods and Julian has walked round many of their woods, discussing practicalities and opportunities - he has also met many owners at the Weald Woodfair held each September in Sussex which he has attended for many years. "Getting Started in your own wood" will also be useful to anyone managing a woodland or to someone who has owned a woodland for many years - it gives guidance on when permission is needed for activities in the woods including planning permission, tree felling and protected species. As the book says, "you are remarkably free to look after your wood how you want to." This is the ideal guidebook to read in a woodland itself: with many short sections and illustrations it doesn't need to be read in one sitting. The pictures are mostly line drawings by John White and Stephen Evans. Published by Permanent Publications in Hampshire this book is rightly described as a "high quality" book which every new woodland owner should have. To further that aspiration, we will send a free copy to anyone who buys a woodland through Woodlands.co.uk. Even though I am not a woodland owner I think I would like to read this book. Perhaps it might inspire & encourage me. Thanks for the review!